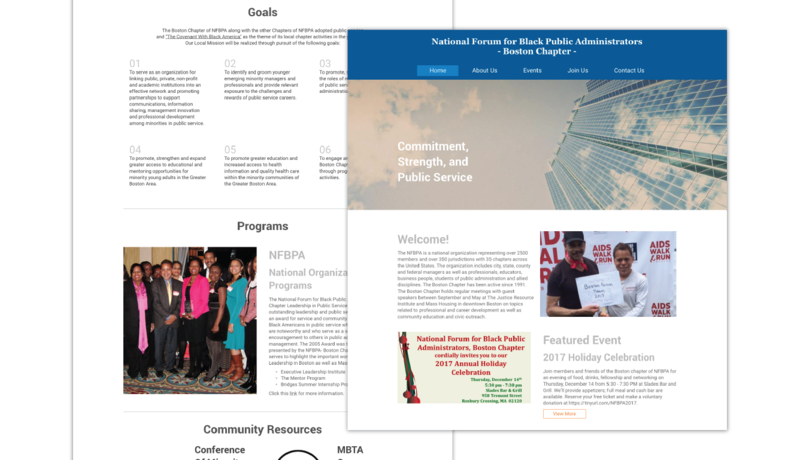 The NFBPA, Boston Chapter needed a complete website redesign. The website was outdated and needed new content to freshen up the organization’s mission and goals to provide the community with resources in the public administrator sector. Along with the redesign, the ability to update and easily manage the content was also a crucial factor in creating a simple, manageable environment for the organization. With limitations in the hosting platform service provider, Spacewalk Studios needed to figure a way to work with these constraints. The main obstacle is having a place to upload document files and the ability to view these files in the web browser without disrupting users and viewers. With no legitimate content management system implemented, not being able to view those files created an issue. Implementing a content management system will be key to hosting document files and making future updates to the website. A simple intuitive system that’s user friendly was needed and the WordPress platform was presented. 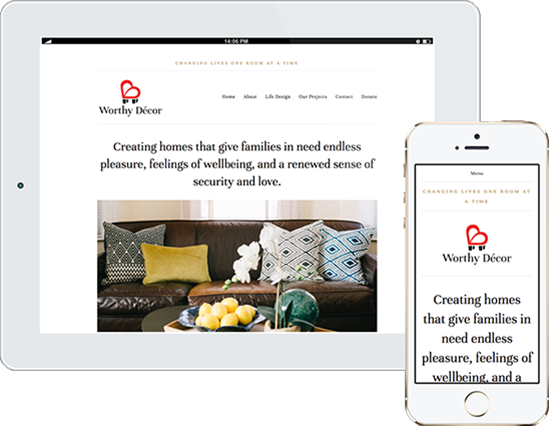 WordPress was chosen due to its user-friendly interfaces and ease of use to manage content. Given the limitations of the platform, being organized with the content was vital in planning and creating a foundation to support the organization’s goals and agenda. With the redesign and implementation of the WordPress content management system (CMS), content was laid out to provide viewers with access to resources along with a way to join and learn about the Boston Chapter and the National organization. Visit www.nfbpaboston.org for more information. In cooperation with Onyx Spectrum Technology in facilating this engagment. Initially, Kelley approached Spacewalk Studios with a request to add additional content to the website, but after visiting the website, found it was a bit out dated and could use a bit of a facelift. The website was fairly content heavy with media and information. Many of these contents were placed in an unorganized fashion and made it difficult for viewers to find key information about the company. Spacewalk Studios was handed a heavy task to organize all the media and information to be presented in a sensible manner. Best approach to this will be to start grouping content and media to specific categories. These categories were then implemented as the navigation menu to guide viewers to specific content about Kelley Chunn and Associates. Having content organized, easily allows your viewers to find vital information about the company. Spacewalk Studios was able to put all the content together that made sense to viewers. Important information that was being lost before is now visibly presented. 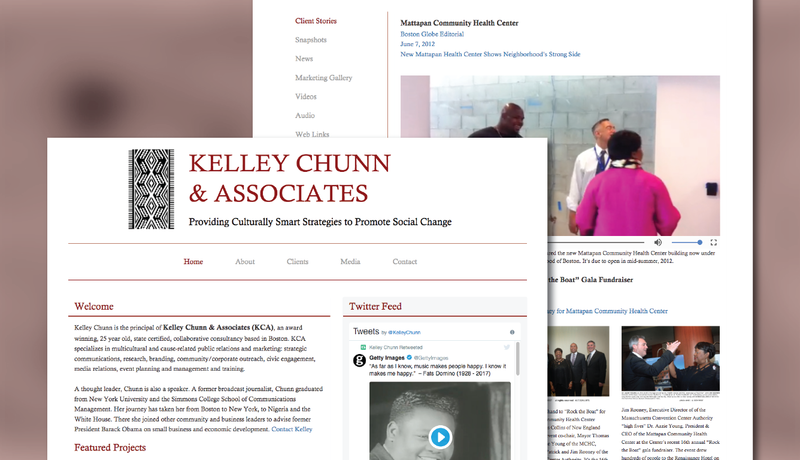 With a more modernized look and feel to the website, Kelley Chunn and Associates can expand their potential to land new clients and partners. The website can be viewed at www.kelleychunn.com. Home In Place’s website was a bit outdated and needed some updates, a quick facelift to the design and layout as well as a better management system. They are a non-profit organization that is in the early phases of development. The Founder, Josefina Pires, needed a better way to make minor updates and add new projects to showcase. Ensuring the platform we chose to move forward with provided and meets the needs of Home In Place. The platform will need to provide the user the ability to self manage their website with making updates to content, images and creating new pages, in a user friendly environment without a lot of coding knowledge, was a major factor in the decision. Spacewalk Studios choose a platform that catered to Home In Place’s needs, with an intuitive user interface, anybody with a little bit of time can learn the ins and outs of the platform. The platform allows the user to have full control of their website. With the chosen platform, Spacewalk Studios was also able to make the requested updates as well as give the website a quick refresh to the layout and design. Ultimately, the platform gave Home In Place and Josefina a peace of mind when future implementations are needed. The freedom to make changes at anytime, will take a load off the shoulders. Spacewalk Studios was thrilled to have the opportunity to contribute in a small way to the organization and their mission to help families. Visit www.homeinplace.org for more information. A disparity study is being conducted at the Port Authority of New York and New Jersey and a sub-site was needed to announce this study to the public. The disparity study sub-site will allow viewers to sign up for anecdotal interviews, complete business surveys and register for disparity study events. The project was presented with a tight deadline and a strict style guide. The disparity study sub-site needed to look and feel like its part of the Port Authority of New York and New Jersey’s main website. Given the limited time frame to complete the sub-site, along with maintaining the style guide, this was a big challenge to take on. Design and develop a sub-site specifically for the disparity study. The sub-site will provide viewers with an overview of the study, answers to frequently asked questions, resources as well as multiple ways to participate in the study. Spacewalk Studios loves a challenge and dove right in to developing the sub-site. 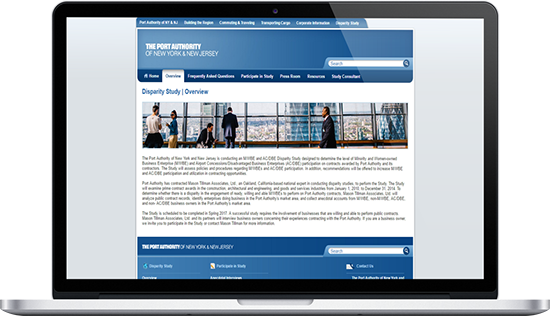 Port Authority of New York and New Jersey’s style guide was followed and the sub-site was presented within the tight time frame. The sub-site can be viewed at www.panynjdisparitystudy.com and provides viewers with vital information about the study as well as multiple ways to participate in the study. 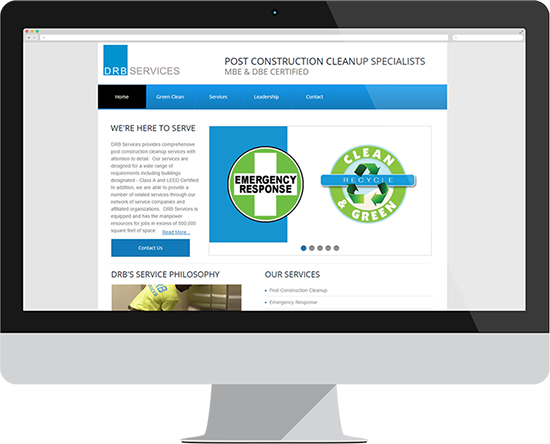 DRB Services already has a website in place and what they needed is a bit of refinement. The website needed some guidance overall on the UI and structure to effectively present customers with vital information about the company and their core values. The refinement will also give their customers and potential customers a better sense of who DRB Services are and the services they provide. After refining the UI and structure of DRB Services website, Spacewalk Studios found that the website could use a tad more content to convey the company’s presence with leadership, their affiliations and core values. The ability to have these information on your website will establish credibility with you business. To establish credibility with DRB Services, we needed the ability to provide trust to their customers. To send that message across, Spacewalk Studios implemented a “Leadership” page, showcasing the company’s leadership in providing the best services available with a clean and green approach as a standard and part of the company’s values to protect the environment. DRB Services established credibility by showcasing leadership with their core values of helping the environment by using clean and green products. Along with having a simple and clean structured website, viewers can have a pleasant visit with a clear and precise idea as to what your business serves. Visit www.drbservices.com for more information. 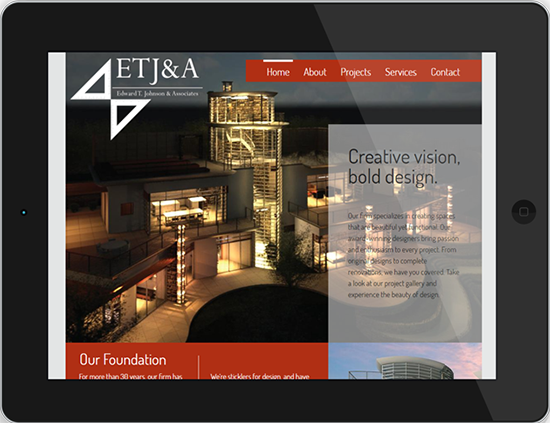 Edward needed a website to showcase his work throughout the years as a Master Architect. Along with being able to display projects he worked on, the website needed to list the services the company offers and allow viewers to find out information about Edward T. Johnson and Associates and what they can do for you. The website was pretty straight forward in displaying key information. The services the company offers, projects worked on and a way to contact the company. One important component was to highlight Edward’s achievements and all his years as a Master Architect. With over 40 years of experience, choosing what to feature and creating a space to exhibit Edward’s knowledge and expertise was an obstacle. Create a space to showcase Edward’s best work to date. Having this space will allow potential clients to see all the achievements Edward T. Johnson and Associates has accomplished throughout the years. A simple website was designed to allow viewers a place to see information about Edward T. Johnson and Associates. Highlighting Edward’s 40 plus years of experience, viewers can see all the knowledge and talent the company has to offer. As well as holding the patent for first modular furniture system, clients can see Edward’s versatility and design skills. Visit www.etjaonline.com for more information.